Pearl of My Sassy Chef and Thea of Words and Nosh are January's Kulinarya Cooking Club Challenge hosts...and since Thea's birthday is this month, they came up with a birthday celebration theme. The challenge is to prepare a favorite birthday dish (entree, dessert, snack, or drink) and make it more healthy by making it into a vegetarian/vegan, lower fat, dairy-free or low sugar version. My birthday falls on Dec. 25, and I grew up celebrating my birthday with lots of mouthwatering holiday food. But aside from Beef Caldereta and Pancit Canton, if there's one thing that I always want on the dining table for my birthday, it's Buko Pandan...a very simple yet so deliciously refreshing dessert that I really love. 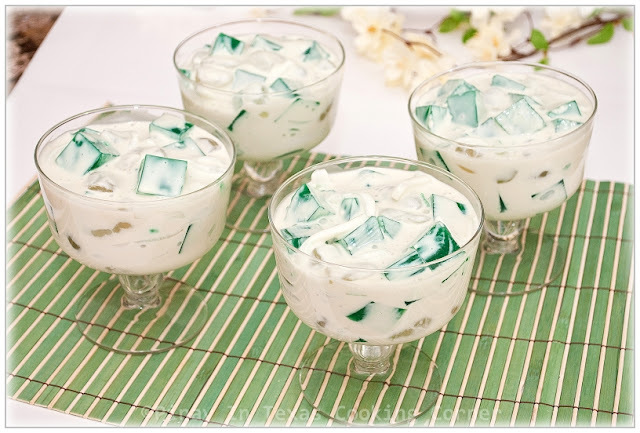 Buko Pandan is a favorite Filipino dessert which is a combination of shredded buko(young coconut) and pandan(screw pine) jelly mixed with table cream and condensed milk. In the Philippines where pandan can be found everywhere, this dessert is traditionally prepared by boiling pandan leaves until all the juices are released. After removing the leaves, the liquid is then used to make the jelly. Here in my side of the world where pandan is hardly available, I use pandan extract instead. To give the jelly a richer flavor, I use coconut juice in place of water. 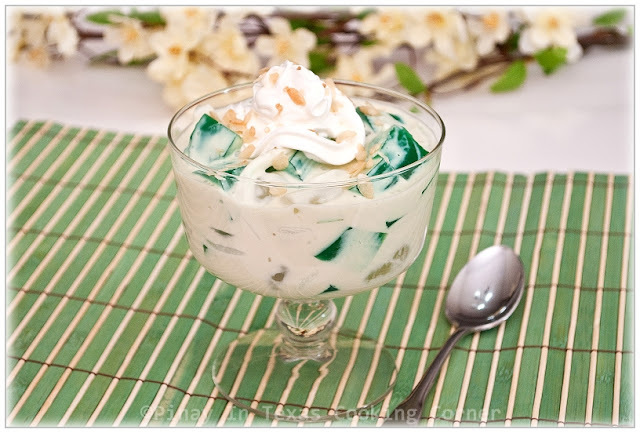 So how did I make my usual version of buko pandan healthy? Well, I made it low fat by using light table cream and fat free condensed milk. And instead of powdered gelatin, I used agar-agar bars. Though a bit tougher and less floppy than gelatin, agar-agar which is made from seaweed is a great and healthier substitute. It is fat free, low in calories and high in calcium. * If you want to use fresh pandan leaves, boil 6 pandan leaves in 6 cups water. Remove the pandan leaves and use the liquid to replace the buko juice and pandan extract in this recipe. 1. Boil coconut juice in pot. Add pandan extract then add green gulaman bars. Stir well continuously, while adding sugar until gulaman is well dissolved. 2. Pour into a flat mold. Use a strainer to remove any remaining solid particles. Let it cool and harden. Refrigerate for about 1 hour. 3. 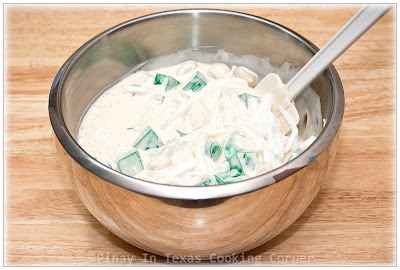 In a bowl, mix the shredded coconut, sugar palm, condensed milk and all purpose cream. Remove gulaman from refrigerator, slice into cubes and combine with the mixture. Chill until ready to serve. Don't forget to check what other Kulinarya Cooking Club members came up with for this month's theme. If you haven't joined PiTCC's 1st anniversary giveaway, you still have time to do so. The giveaway will run until January 22, 11:59PM EST. This looks so pretty! I love the combination of coconut and using the coconut juice in the jello/agar agar mix. It seems very refreshing. I have yet to try working with agar agar (except my experience with it in college science when using it to test different bacteria LOL!). I will have to get some and use in place of gelatin. Oh I have never tried that Filipino dessert. Looks great Tina! Try it..I'm sure you'll like it, Linds! I love, love Buko Pandan! Glad you shared the recipe! Must try this soon! Happy Birthday to Thea...thanks for hosting the Jan. KCC with Pearl! Great job making it low fat and still delicious! great way of making it "healthy" tina. I love buko pandan and I was unmindful of the number of calories it had as I would consume bowl after bowl after bowl haha. Tina , 'tis a good recipe and looks really yummy ! Love it ! 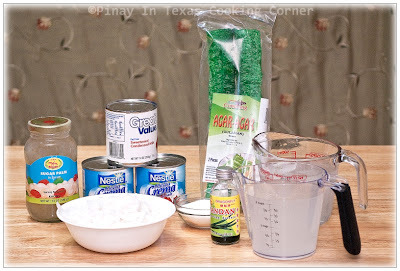 I used to make buko pandan salad when I live in the Philippines. I boil the coconut water with pandan leaves and that's what I use to make the gelatin. We don't have all the ingredients where I live now in this part of the U.S. Your post made me crave for it! Yummy! I love coconut in desserts, and I'm intrigued about this dessert. It looks quite festive and delicious. You should try it Alaiyo! It's really good! Nice to see you here, Pearl! What a fun theme for your challenge! And just as fun to be able to eat one of your favorite birthday treats with no guilt!! Hope you're enjoying your weekend, Tina! Wow, I miss all these Filipino Foods. I will visit here from time to time to fill my stomach. Awesome blog. Keep up the good work. Oh, thank you! That's so nice of you! Glad to have you here! Oh, I love buko pandan! This looks great. One question though- what is "table cream"? Is it like evap milk, or something else? Table cream is like whipping cream but with less fat content (18-30%). Wow! just in time! A good friend of mine had requested this from me for her birthday over the weekend. Will surely try this one with the pandan leaves i still have in the ref. Yummy entry for this month's challenge! An awesome dish! I must admit there are certain ingredients that I have never heard off. Thanks for sharing. Definitely my favorite pinoy dessert !thanks for sharing your recipe ! Just delicious! A mix of creamy yet low fat cream (yeyy!) 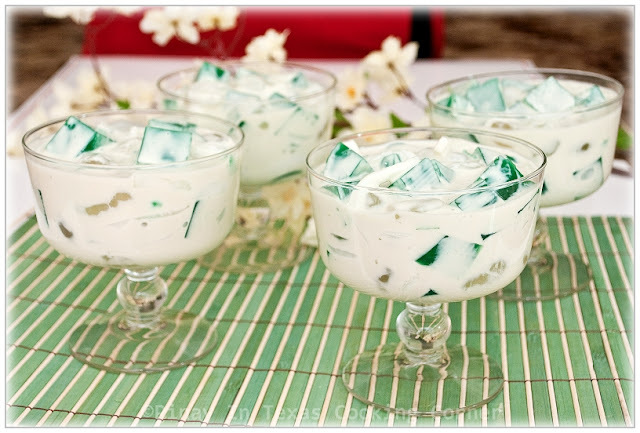 and refreshing pandan jelly is the perfect dessert for a birthday party. Ms. Tina, is it ok to use water instead of coconut water for the gulaman?